I woke up early to work on today's autumnal Color Challenge, which is to use River Rock, Really Rust, and Chocolate Chip. 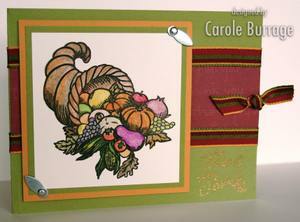 I pulled out these cute scarecrows by Close to My Heart, and looked through my stash of patterned paper; this Simply Seasonable stripe by EK Success/Inspirables fit the bill perfectly. I used the sketch that Bad Sherry Cheever featured for her and Jeanne S's weekly Just Because We Wanna Challenge. The card base is a 5.5" square. You could have knocked me over with a feather when I looked in my email in box this past Sunday and found an email from the one and only Nichole Heady, world famous paper artist and co-founder of PaperTrey Ink, one of the most innovative and stylish stamp manufacturers in the industry! I had submitted my Altered Jack pumpkin for consideration to PaperTrey's guest star stamper contest. 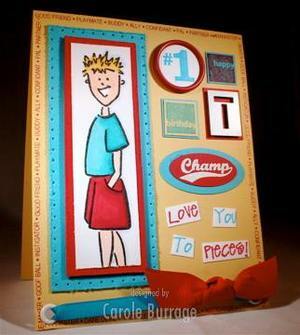 While Jack didn't win the big prize, he did earn an Honorable Mention and was featured on Nichole's blog! Nichole said that there were over 450 entries this month, so being one of the Honorable Mentions isn't half bad. I'm trying to submit more and more of my stuff to various places to see where it might lead. A very important lesson I've learned from writing is not to take rejection personally. That was a really bitter pill that took a long time to swallow, but now that it's finally digested, I'm cured of thinking my worth as a writer, stamper, etc., is contingent upon whether or not a particular agent, editor, design team or what have you accepts or rejects a particular project. As my good friend, writer Will Clarke once told me, "Who cares if they don't like your stuff? They're just not you're tribe." The challenge is not necessarily to change your style, but rather it's to find your tribe: where your style fits the look and feel -- the 'vibe' if you will -- that company or publisher is going for. That being said, I do think that one always needs to be in the process of refining one's craft, and for those like me who are looking for their tribe in the paper crafting industry, Lisa Strahl (Mona Lisa) has some excellent advice on her blog. Anyway, the email and blog feature from Nichole was a nice little boost and very encouraging. Are you ready for me to quit blabbing and tell you how to make an altered pumpkin of your very own? Okay then! 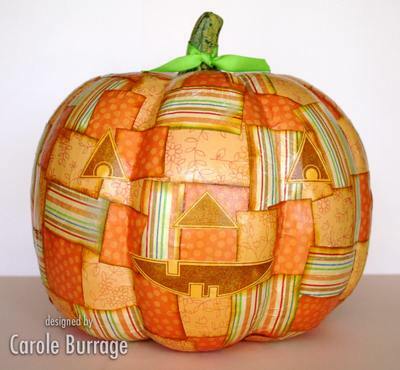 * Adhere the pieces of paper to the pumpkin with ModPodge, slightly overlapping each piece to make sure the pumpkin is completely covered. After you've initially stuck the paper to the pumpkin, spread a light coat of ModPodge on top of the paper to give it sheen and help it stick. Smooth the paper as you go to avoid bubbles and wrinkles. *Let the pumpkin dry for several hours or overnight. 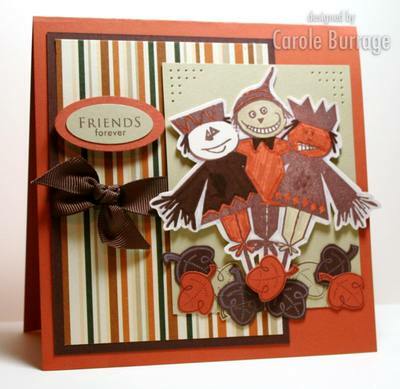 Meanwhile, stamp the face of the pumpkin on a coordinating color of cardstock. * Adhere face to pumpkin with ModPodge. *Tie ribbon on the stem. Now you have a cute little pumpkin that won't rot and can be enjoyed for years to come! I don't know if you can read the sentiment, but it says "Give Thanks" and is heat embossed with Ranger's Enchanted Gold embossing powder. Supplies used: Cardstock -- Old Olive, Very Vanilla, More Mustard, dp by KI Memories; Stamps -- Give Thanks by Close To My Heart; Ink -- Palette Hybrid Noir Black, VersaMark; Accessories -- Prismacolor pencils, odorless mineral spirits, blending stumps, ribbon, photo stays, gold embossing powder, 3-D Dots. So are you wondering where the title of this post is coming from? Do you remember that song from the early eighties, "Nobody" by Sylvia? It was a country song that crossed-over to the pop charts. Anyway, for some reason I started thinking of this funny story that Sean (my DH) told me a long time ago. He and one of his buddies (Stever) were judges at some sort of 4-H talent show. "Share the Fun" is what I think he said it was called. So this girl gets on stage and starts singing "Nobody" a cappella, and she doesn't just sing the lead vocal; she also sings her own back-up vocals. So when she sang "...does she think she's being clever?" she'd raise her voice a couple of octaves and then sing "Clev-ah! Oh-ho!" For some reason I thought of that today, and since then, I haven't been able to get that annoying tune out of my head.